As mentioned previously, I am collaborating with the small European manufacturer, Bella Ciao, in developing my own version of their classic lady's bicycle model. 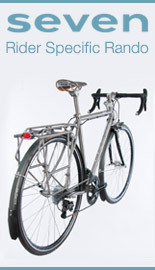 This special edition bicycle will be available in late Spring 2011, exclusively at Harris Cyclery in West Newton, MA. I do not yet have a prototype to show you, but upon reader request I am making the announcement regardless. Read on for all the details! Last year I received a 'Corvo Citta Donna' bicycle (shown above with stock everything, other than the saddle and kickstand) from Bella Ciao as part of a barter exchange. My impression of the bicycle (you can read the review here) was very positive, but of course not without criticism. Basically, I absolutely love the frame design, the quality of construction, and the handling. But were it my bike, my choice of components would have been different. There was some debate about this between myself and Bella Ciao, and they did not agree with my criticism. But they found my point of view interesting. And after some back and forth, they invited me to put together my own version of the bicycle - and I gladly accepted. Bella Ciao has now made a deal with Harris Cyclery, who will sell the bicycles in the US. If all goes according to plan, they should be available by May 2011. My role in the project is that of a consulting designer. Describing their take on bicycles as "the poetry of freedom," Bella Ciao is a small company based in Berlin with an attitude that is both serious and tongue-in-cheek. Bella Ciao frames are handbuilt in Northern Italy by a family of framebuilders who have been in business since 1898 (see image above). They are then powdercoated and built up in Germany. The standard line-up includes cro-moly men's and lady's city models, deluxe men's and lady's models with Columbus tubing, and a single speed/ fixed gear model. There are occasional special edition bicycles as well. You can read about all of these on their website in German and English. While I find the bicycles beautiful, what really attracts me is the performance. Of all the upright bicycles I have tried, I have found my Bella Ciao bike superior for long rides, and especially for hills. I do not say that lightly. It is an easy bike in every respect: easy to ride, easy to carry, easy to own. 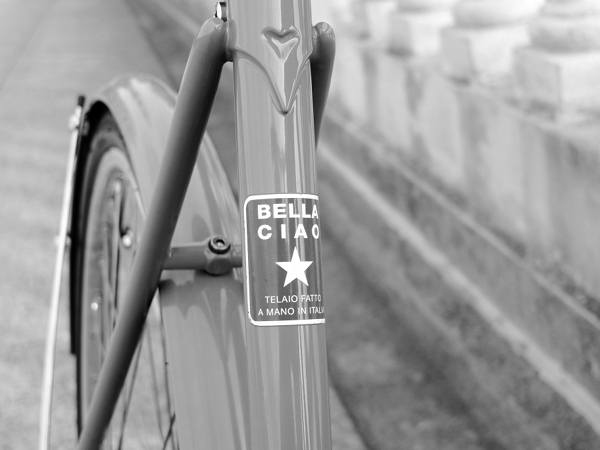 Additionally, I like it that Bella Ciao frames are fully lugged , including the fork crown. And they are handmade. There are other terrific details, such as the proprietary handlebars and wheels (yes, they make their own). 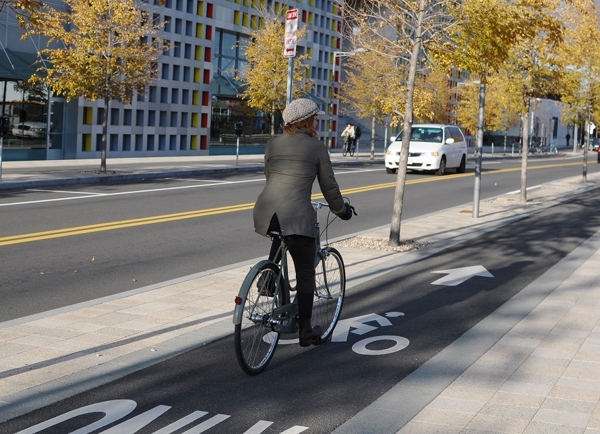 All this is becoming increasingly rare even with classic modern bicycles. Based on Bella Ciao's cro-moly Corvo Citta Donna (lady's) frame with the classic "Frascona curve" of the top tube, with the additional feature of internal routing for the dynamo lighting; complemented by a full (two-sided) chaincase with opening at the rear and fenders. The frames are 54cm and will fit ladies 5'5" - 5'10." To give you an idea of fit, I am 5'7" and this is how I look on my bike. The model in the pictures here is 5'10". The colour will be custom to this edition, most likely some shade of pastel green. Not the same green as you see on my bike (I think it's a bit too military for most people), but perhaps some version of sage. Or maybe not green at all and I'll have a reader's vote at a later point? 700C proprietary Bella Ciao wheel rims of light, high-polish alloy, with cream Schwalbe Delta Cruiser tires. 3-speed Sturmey Archer hub with coaster brake, classic trigger shifter; front caliper brake with classic chrome city brake lever. "Deluxe" (high polish) alloy Bella Ciao bars. The model I like are a sort of hybrid between Porteur and North Road style bars. Posssibly my favourite handlebars for a city bike thus far. Internally routed, hub-generated dynamo lighting, front and rear, with standlight feature; classic look. There will be a rear rack that will elegantly suit the frame, and I am currently working out the details. If all goes well, it will be a custom handmade rack - fingers crossed! Including rack and lighting, total weight is likely to be around 33lb. The 'Superba' will be at Harris Cyclery by May 2011. There will be 12 bicycles available. Harris Cyclery will take pre-orders with a non-refundable $300 deposit. If you would like to pre-order, please contact Elton Pope-Lance at 'elton[at]harriscyclery[dot]net'. I believe that 11 9 of the 12 bicycles remain at the moment. I am not involved in the sale of the bicycles, so please contact Harris Cyclery and not me with questions about purchasing. Will you like this bicycle? As someone who does not believe in "the" perfect bicycle, I can only say that it depends. What are you looking for? What features please or disappoint you in your current or previous bicycle? Or are you just looking for something different? 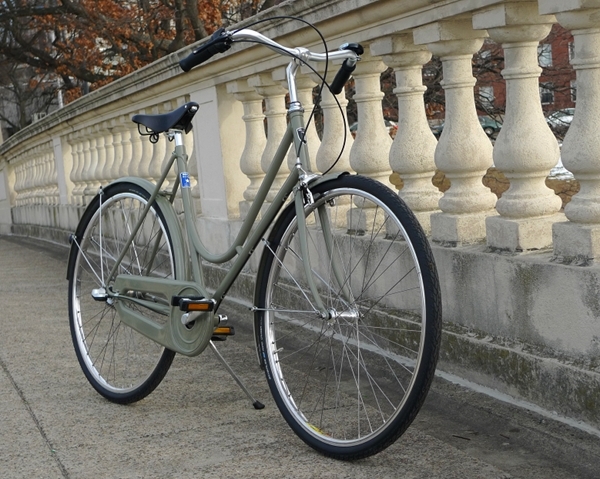 Bella Ciao bicycles are light, elegant, nimble, and easy uphill. 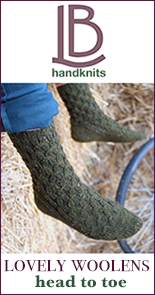 They are also comfortable and very simple. If you live in a hilly area and struggle with a Dutch or English Roadster-style bike, a Bella Ciao could be the perfect solution. However, if you need to transport 50lb of groceries and two children as part of your daily routine, I think there are more appropriate options. You might also find it helpful to read this post, comparing the different categories of upright bikes that are currently out there. [edited to add:] As for my version of the bicycle specifically, please understand that it is exactly that - my version. Obviously it will not suit everyone's tastes, but I hope it will appeal to a dozen people in North America who cannot find what they are looking for elsewhere. If there is popular demand for an alternative version (non-coaster brake, diamond frame, etc), there could be another batch later. Also, for those interested in the standard production Bella Ciao models, there is a possibility that Harris Cyclery may be selling them in future - please express your interest to them directly. I will post pictures once the 'Superba' prototype is built up, but realistically that will not be for at least another month. I will also write in more detail about being involved in this project, as some might find it interesting to know more about the industry. This has certainly been an educational experience for me so far, and I hope you like the end result. If you have any questions, please feel free to ask. America really does need the choice of all the european city bike styles instead of what passes for urban use in America today. Darn!! My brother said that my Retrovelo looked "very Italian." I said "Good guess, but it's German." Then he said it was not a guess, but an observation. At that point I told him that Italian frames had a very distinctive look... it did not end well. But an Italian would go very nicely with my German and two English bicycles.
" . . . will fit ladies 5'5" - 5'10." Love it! Men's version? Have you considered the front dynamo/drum brake hub that Sturmey Archer offers? kfg/John - The bike is lady's only for now, though if there turns out to be demand, there can be a men's as well. It was actually I who did not think there would be demand. Harris Cyclery suggested to me from the start that perhaps there should also be a men's. Anyhow, if you fellows are serious, please let me know. John - No front hub brake, and here is why: I am unhappy with the stopping power provided by the 60mm front hub brake (the one we see used on most bikes), especially with a woman's grip. Since Bella Ciao is sportier and faster than many city bikes, I think front brake stopping power is especially important. The 90mm hub brake provides much better stopping power, but it is huge and would not go well with the look of the bike. I think going with the traditional caliper here for the front, combined with coaster for the rear, is a better idea. You had me until coaster brake, but I am very excited to see it nonetheless. Sounds like a great collaboration. I want! but here in pittsburgh I'm still afraid to try the upright city bike thing. 33# is light, and you say it handles hills...but I have my doubts. I hope one day to be able to try test riding a bike like this around here. I think you underestimate the number of men who follow your blog- cast your mind back to your touque give-a-way! I accept your reasoning on the front hub brake. Perhaps the men's model could have the 60mm front hub brake as they have a stronger grip? I really like the idea of the internal brakes for winter riding. "The bike is lady's only"
Are they going to look down my pants to certify me as a valid customer, or will the beard alone be considered sufficient to disqualify me? "if you fellows are serious . . ."
I am, but my point wasn't about making a DF model available; I can build up one of those on my own. In any case, I'm not a customer for this particular model as it doesn't address the issues I brought up in the original thread, but I do still love the frame. neighbourtease - Yes, the hand operated vs coaster brake is something that is just a matter of preference. I prefer the coaster, and I think that they are currently under-represented in the US, so that was the basis for my decision. kfg - Sorry, I meant the step-through frame. I certainly will not trouble you to display the contents of your pants! I shall hold out for the Neorealista. "I certainly will not trouble you to display the contents of your pants!" So, I have a question about sizing on this bike, if you would be so kind to answer. I notice in the photo of you on the bicycle that the seat post seems to be positioned pretty far down, and you are 5'7. Do you think 5'5 is pushing the limits of the low end on someone's height. Meaning, if an individual was that height, or a little shorter, do you think it would be an uncomfortable ride? Then of course there's the whole "what shoes am I wearing when measuring height" kind of thing... sure, I can be 5'7 too... in the right shoes. I'm honestly not trying to be a total freak here, but I'm really wondering if someone who was say, 5'3 or 5'4 would be able to ride this, or if it would be completely out of the question. I know we're all proportioned differently with longer and shorter legs, but since you've been on this frame, perhaps you can provide some insight. Also, congrats on the design/collaboration. Sounds like a truly interesting and rewarding experience. Looking forward to developments on the custom rear rack as I recall in an earlier post you were looking for a Dutch style version which would very much be in keeping with this bicycle's albeit Italian/German look. And yours will be baptized Montserrat (as La Superba is the nickname of Spanish singer Montserrat Caballé). I'm with neighbourhoodtease - the coaster brake is a turn off. I really wanted to like the coaster but I feel safer in traffic with hand operated brakes (whether drum or rim). - the S/A hub-brake on the "x" model hubs is a 70mm, not a 60mm. Performance is better on the 90mm version, but the 70mm's are pretty good (surely, as good a s a low-buck caliper, imo, and no-contest in wet weather) once they burn-in. - Looking at the differences in spec between the standard version and the deluxe, it seems that we're looking primarily at niceties such as a rack and some lighting, and a switch from the nexus 3speed to the S/A 3speed, and a switch from black road cruisers to creme delta cruisers. Does that sum it up, or am i missing something? I prefer the S/A 3speeds to the nexus, but some ppl might like the broader range of the nexus. . . I really like this bike's design, very elegant yet understated. 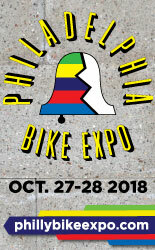 I was looking at the Bella Ciao website and it appears that they don't offer the bike in the same color as yours, although there is a brighter green. Is yours a custom color or have they changed their options? Only one size, and too big for me. Also, coaster brake? Really? Oh well. I can't afford another bike anyway. Screech/rob - I did not find the 70mm SA front drum brake to be sufficiently strong either (I had it on my Pashley). As for the differences: internally routed dynamo lighting (which requires a small change in frame construction), rack, and a change of most components. Rear hub, front hub, shifter, saddle, tires, handlebars, grips, headset, pedals, brake lever, cable housing, frame colour, and probably a few other things I am forgetting, will be different. In terms of components, my version is not a "better" version; just my take on it. The inclusion of the lighting and rack however, are obviously upgrades compared to the lack of them. "Yes, the hand operated vs coaster brake is something that is just a matter of preference." Agree, but if you conduct a poll, I am sure that more than 70% people will prefer hand operated than coaster bake. The bike is made to sell, isn't it? I personally can't ride a bike with coaster brake, it kills my knees. I also hope there are more sizes available, especially if you are going to introduce male version. Sounds beautiful - but why only 1 size? What about us Amazon women? Well, I guess I will have to get a WorkCycles after all! ;-) They seem to be the only company that makes a 61cm ladies bike! Anon 6:22 - Re coaster brake: It's not just about popular demand, but about my vision of the bike. This is a very small batch of 12 bikes that is precisely meant to appeal to niche tastes. It is not for everyone and I don't present it as something for everyone. Otherwise, it would not be my take on the bike, right? If there is sufficient demand for a non-coasterbrake version of the bike, it is possible that there may be another batch. As for sizing: Bella Ciao is a small company right now and the lady's frames are only made in one size due to the logistics of costs. This may change as the company grows; it is not up to me. The diamond frame is currently made in 4 sizes, see here. Patience - How tall are you? "... I notice in the photo of you on the bicycle that the seat post seems to be positioned pretty far down, and you are 5'7. Do you think 5'5 is pushing the limits of the low end on someone's height. ... but I'm really wondering if someone who was say, 5'3 or 5'4 would be able to ride this, or if it would be completely out of the question." It depends on how you mount and ride the bike. Are you able to ride a bike without touching the ground with a toe? I am not, which is why my saddle is so far down. If you don't need to touch the ground, then I think 5'4" is possible. Also, keep in mind that the bike size is measured from center of bottom bracket to top of seat tube, and not "center to center" as some other bikes. Using the latter method, the size would be 52cm. Hope this is helpful! Veloria: Maybe you could use the Velo Orange rack if custom doesn't work out? I think it would look good on that bike! This is all very exciting! How incredibly flattered you must have been they asked and how lucky they are to have you. I'm dying to have one. I hope Harris Cyclery has hired extra staff to man the phones! Congratulations, can't wait to see it! Ann Ladson and others - Thanks so much for your faith in me and for the kind words. I don't think it'll be as bad as the phones ringing off the hooks, but I hope they will manage to sell the 12! Anon 7:04 - That is one option I considered if the custom rack is not feasible; however I am not sure that it is the right choice. There is a different existing rack that works better (TBA), and that's the one I'll probably use. "...on the custom rear rack as I recall in an earlier post you were looking for a Dutch style version which would very much be in keeping with this bicycle's albeit Italian/German look. I too have been searching for an elegant alternative to Pletscher for my Pashley Britannia, will your version be sold separately?" Basically, we are now in the process of developing a rear rack prototype, and only when this is finished will it be clear whether the racks will be feasible (price-wise) to produce for 12 bikes given the retail price that has been agreed upon. Either way, yes it is possible that these racks will be available for sale separately. I didn't have any input into designing this bike, but I obviously saw the stock model and the front caliper is a Tekro, a high-quality sidepull with lots of stopping power. It's a very decent brake, custom frame builders use these. It's true that in some conditions caliper brakes perform less well, but I would be comfortable with this one. Regarding front drum brakes, I think that stopping power on the small SA drum is *terrible* and I have tried a half dozen samples in person. It's not an issue of grip strength, because if I squeezed it harder I would probably ruin the housing, end caps or something would snap. The larger (90mm?) SA version, has excellent braking power, but is visually distinct (is that a motor? ), larger & heavier. Nonetheless, I sometimes wish the 90mm version was on my Pashley, though. Sounds like a Great project and lots of fun for you, good luck with it. I will check it out at Harris when it comes in. Fwiw, I am 5'3 and ride a 52 cm bike with a couple of inches of visible seatpost. So it might be possible that more women can ride this bike if they have longer legs. It could be helpful to offer inseam guidelines, too. I believe that 10 of the 12 bicycles remain at the moment. I'll enjoy seeing the project progress, and reading this ongoing conversation! Nice idea about the possibility of a frame color vote, although I think you should have special veto-ing power. Hah! I remember awhile back you had been mulling over potential crankset replacements for this bike over on BF. Did you change that up here for your Superba? I too am curious how this bicycle would measure up for us shorter riders (I am 5'5", but with a short inseam). Amanda - See my comment at 6:42 pm above regarding sizing. It's possible that you will fit the bike, if you don't need to touch the ground. Yes, I wanted different cranks for my bike and was in fact planning to change out most of the other components as well, which is what led to Bella Ciao suggesting my own version. However, I have not found alternative cranks that would look the way I envisioned - not even for just my 1 bike, let alone a sustainable source for 12. We'll see, but as of now I think the current cranks are the best option. Pedals will be different though. This is so exciting! I love, LOVE the idea of a woman taking the reins and designing her own perfect bike, based on her own experiences. The fact that you stood strong on your opinions, even when the bike company respectfully disagreed, is awesome. You are an inspiration. :) I look forward to seeing the prototypes! This sounds amazing! It's like the impossible dream bicycle that no shop would have, and it's all here, (almost) ready to go!! Seriously, I would've chosen almost exactly the same components, including the 3 speed coaster hub (I've fallen in love with coaster brakes this winter). It's like when you're sitting around with your bike geek friends and they're like "What would be your ultimate bicycle?" And you make an impossible list of all these things it would have to have, and this is it! Sorry, geeking out of control here. I can't wait to see what it looks like! I find it interesting that Bella Ciao didn't agree with your criticism. Are you able to elaborate on this any further? Did they just not envisage this bike as a commuter with racks and lights or was it about more specific component choices like hubs and brakes? Anyway, I'm incredibly jealous. What an honour. John - It was a bit of both. I think for a frame that is as classic, graceful and minimalist as the Bella Ciao, classic components are appropriate. For that reason, I find that the rubber twist shifter, the short "interruptor" style brake lever, the puffy grips, and the Shimano rear hub with the enormous, super-modern adjustment box that are on the stock model detract from the personality of the frame, whereas more classic component choices would enhance it. The fellows at Bella Ciao disagree and are happy with their choice of components. But this is really a matter of taste, and I think that plenty of my readers would prefer the stock components over mine. And the other thing is that yes, my vision of a "city bicycle" includes a rack and lights as inherent parts of the model. Bella Ciao currently does offer a Pletscher rear rack as an accessory, as well as dynamo lighting as an extra option, but their idea is that the bike itself is presented as light, airy and unencumbered - a creature of the sky. I understand the concept, but to me it is unrealistic. Owners will end up clipping lights and racks to the bike anyway to make it useable in an everyday setting - so why not integrate these things to begin with, so that they are more harmonious with the frame? Those were some of the suggestions I made. Basically, there is nothing shocking, novel, or ingenious about the bike I am putting together. It is simply a mix of all my favourite stuff - which I have never found all together on one stock bicycle model! Dottie - Thanks so much for your encouragement, it means a great deal! Thank you to the ladies under 5'5" who chimed in about their experience with 52cm and 54cm frames! I wanted to be conservative and cautious with my recommendations, but your experience is more telling than anything I can suggest. Fjelltronen - The raven headbadge is definitely staying. I like it a lot, and after all it is still a Bella Ciao bike! But the Superba model will have its own decal (as does each model) somewhere near the bottom bracket. The decal on the seat tube in the last picture says "handmade in Italy". That will stay as well, but I am hoping they can change the colour from the standard blue. I would like silver or at least slate gray. I use the 70 mm SA drum on both my Raleigh DL-1 and Twenty. The stopping power is better on the smaller wheel, the reduction in size from 28inch as used on the larger Pashley (and my DL-1), to 700C should yield a slight improvement. Personally I find my drum brakes great, even on the DL-1. Under normal conditions they are modest but effective, but the braking power doesn't seem linear in relation to the force applied at the lever; when I have been in some hairy situations I have squeezed the levers that little bit harder and they have given me a lot more stopping power when I really needed it. Having said that, I can see why you might prefer rim brakes here, but to me they just don't feel quite low-maintenance enough for a dependable everyday transportation bike. Did you consider Shimano rollers during the design (such as the ones without the cooling fins)? The advantage of those is that the brake becomes modular again, rather than an integral part of the wheel. Mr C - I have tried Shimano rollerbrakes many times and do not like them. I specifically wanted the rear SA coaster + front caliper combination on this bike; I think they work really well here. Once again, a matter of preference. "I think you underestimate the number of men who follow your blog"
1. There are more options for men than for women already in existence, so if I have a choice of 1 model only, a women's model would be more helpful. 2. I think men tend to read the blog for different reasons than women. Many women read for bicycle advice. Many men read just as food for thought, as well as for the debates and arguments in the comments section. The emails I receive from women usually ask me for bicycle advice (including where they can find a good coaster brake bike!). The emails I receive from men are usually just to say hello, to show me pictures of their bicycle builds, or to further debate some point that was brought up in a post or in a comments. So while I have many male readers, I am not sure that all that many of them would actually seriously be in the market for a diamond frame Bella Ciao. I could be wrong about this of course, but that is my impression. "...I really like the idea of the internal brakes for winter riding." The rear coaster brake is an internal brake. For winter riding I would suggest using it predominantly, which is what I do. And yes, I know that I am opening myself up to potential further critique, but that is my stance. Front brake is unsafe in the snow anyhow, so whether it is caliper or drum is not important. Velouria - I forgot about the weird brake lever on this bike. I think your version will look perfect. Complete. Oh and I definitely read for advice. I even bought my mum some Delta Cruisers for Christmas! Fair enough about the headbadge and decals! I'm sure the end result will be gorgeous. I was skeptical at first, but when I ride it myself I enjoy that particular function. It sort of reminds me of riding [horses] and achieving a more centered position by using leg and seat aides, position, and weight more effectively than the reins for changing speed or halting. That's sort of a stretch, I know! But, it work for me. As a man I read your blog primarily because it's very well written and the photographs are never less than excellent, secondly it's about bikes, finally it provides an insight that I don't see very often. Have you considered frame building? You seem to have a love of form that I think would translate well. You could start by designing lugs, then cutting them, then joining them with tubes. I not aware of many female frame builders and, I imagine, too many frame are designed by men and I'd be interested to read your exploration of that area. Best of luck with this project. Ciao bella. Like Patience, this bike is too small for my amazon frame (6 feet). That definitely bums me out cause this bicycle sounds awesome! It is frustrating that many bicycle companies do only one size of their step-through bike for women but will have several size options for their bikes for men. Like they recognize that men come in many heights, but not women. Anyway. That is not what we are here to talk about. Congratulations on this amazing venture! I am totally excited to see the final product. With your supervision, it will be impeccable. To Kara, Patience and the other tall ladies: For a small company like Bella Ciao, it simply comes down to financial feasibility. The framebuilder charges different rates depending on how many frames in every size and style are made. And it is not viable to add a 60cm+ stepthrough frame as a standard model, unless the demand for it is sufficient to cover production costs. 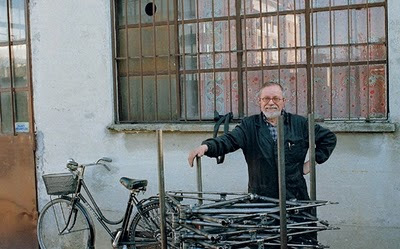 Gazelle and Workcycles produce bicycles in greater quantities than Bella Ciao, which is why they can afford to make the super tall frames as standard. I am sure that Bella Ciao could make a one-off in any size you want, since the frames are made by hand anyhow, but it would cost more. That being said, I think that Bella Ciao's Uomo is one good looking bike (which comes in my size). I am beginning to think that I easily could rock a "boy's bike". Mr. Colostomy - "the braking power doesn't seem linear in relation to the force applied at the lever"
Which is why I have said I'd descend a mountain with a coaster brake and a front caliper, but not with a front drum. While the idea of the internal brake is nice, unless they lack any real power they can be treacherous. Velouria - "more classic component choices would enhance it." Like cranks that aren't blade shaped. "Many men read . . . for the debates and arguments in the comments section." I think your pronunciation loses the English description of this superb bike. I am calling it the su-PERB-a! Lovely bike, V. And I agree with all your aesthetic choices for it. for all the bicycle partisans out there. Are these going to be on the floor at Harris or is this like a behind the counter wink wink secret handshake kind of thing? Probably will be coming to the area soonish to collect my Dad's Royal H, and I would like to try the size. Carine - They will definitely be on the floor at Harris in May. But if you'd like to know whether it fits you earlier, email me and you are welcome to try mine. To be honest, I would be surprised if it fits you - but oI suppose you never know! Wow. I love it. I want one. At 5'4" - and far away in Chicago - I might be pushing the size minimum. But it looks gorgeous. (And I could get used to not touching my toe down, right?) Congratulations! I like the concept of Bella Ciao and posted already some news about them on my blog (in german). I hope to meet those guys at the "Berliner Fahrradschau" bike show in Berlin in march. By the way: great blog! 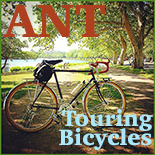 Thanks for sharing your personal perspective on "lovely" bicycles. I've received a couple of questions over email asking to clarify whether this is a "Limited Edition" or a "Special Edition". The reason I call it the latter, is that I cannot guarantee that the batch of 12 will be the end of the run, or uniquely identified should the run continue. For that reason, I think it would be false advertising to call it a "Limited Edition" - which in my mind is defined as "no more than 12 will ever be produced, so your bike will be extra valuable/collectable for that reason." Both Bella Ciao and I are open about our relationship continuing after the first batch. There might be a second batch and it may be somewhat different (a different colour, or a slight change in components or accessories). Or if this batch proves to be insanely popular and there is demand for the exact same bike, that may happen as well. Or we may decide to stop. The point is, I cannot promise a limited run. Therefore it's a "special" and not a "limited" edition. Hope this explains it! I'm very excited for this bicycle, and for you, Velouria! I've been reading your blog for a few months now, and have been considering buying a transport bicycle of the Pashley, Gazelle ilk with some hesitancy. Super-hilly Pittsburgh can make cycling difficult in general, before introducing the issue of gearing (weight isn't much of an issue for me - I currently ride an old Schwinn that's about forty pounds). The get-up-and-go of this bike is quite promising. I wonder, however, about the choice of caliper brakes for the front brake. You always praise drum brakes for their virtually weather-proof stopping power, and deride the inconsistent performance of caliper brakes in rain and snow. Precipitation of varying states are a perpetual concern in Pittsburgh, and reading your blog has made me realize how much I would prefer anything but caliper brakes if ever I do make a transport bike purchase. Why the choice of calipers? and I really dig your drab green very much. it's beautiful, different yet not too girlie.